I think that’s what Piwnica pod Aniolami means – anyway, it is the best translation from Polish to English I could find for it. 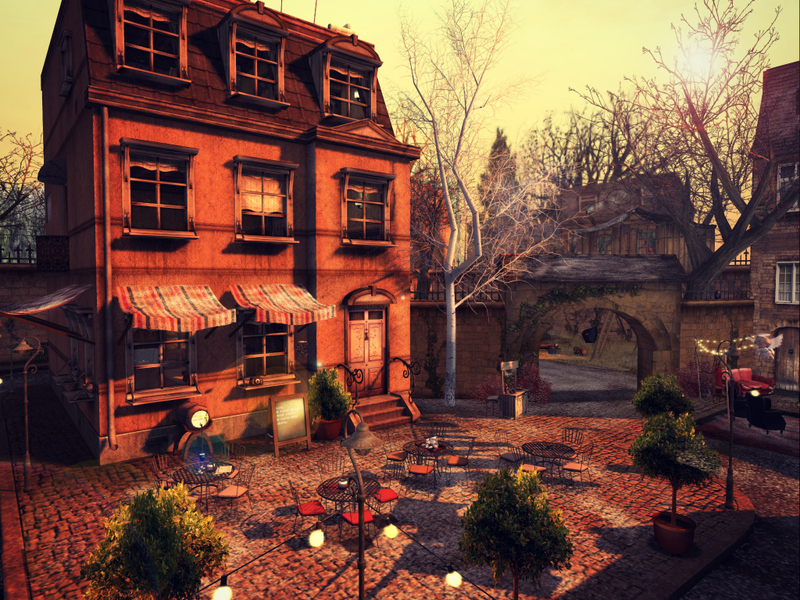 All I know is it is a lovely little place in Second Life with a quaint courtyard, a playground and yes, there is an angel hovering. It made a nice backdrop for the new things I found at Collabor88. The jacket and top, skirt, hair and necklace all came from this event. I picked up a few more things but for me, it was a restrained shopping trip. There are lots of well-made items, but this month’s theme of Supernova just didn’t speak to me. At least not as loudly as this event normally does. Which is probably a good thing, at least for my wallet. I did like that some of the regulars teamed up with another designer to create complimentary items. The bomber jacket and skirt match perfectly and are from a collaboration between House of Fox and Emery. The jacket has the bonus of an optional top you can wear (as I did) with separate alphas to accommodate either look. And although they didn’t make it into the photo, I found a pair of cute shoes from tulip. that are a great match, even though they teamed with ISON. I’ll close with a photo of the courtyard, without me in it. It is worth a visit, whether you speak Polish or not. Rather like traveling in real life – you don’t have to speak the language to appreciate the beauty of a place. I love this place! I find it so peaceful and full of romance! Of course, I was sitting there alone enjoying a glass of wine.. laughs.